Posted 6/2/2017 8:52pm by Josie Hart. What a wonderful first week of CSA Distributions! We loved seeing so many familiar faces and meeting plenty of great new folks. It reminded us that although we don't see much of each other during the winter months, we all are part of a real special community that cares about local agriculture and good food. As we work to iron out the kinks between our half share and full share, please know we are doing our best to provide the best share for all sorts of eaters. Vegetable selections in the two shares may vary week to week. Hopefully you tasted the fermented drinks at distribution, and may be considering signing to purchase a weekly share of biobeers and cultured veggies like curry kraut. Use this link to make signing up easy. This week we've been getting a little rain, then a little heat, and a little rain again. . .which means the plants in the field are going crazy! We are so excited about what is growing out there and as these weeks are starting to ramp up, it's nice to think about what it is we begin with: the soil. Every year we test our soil in each field to determine what it needs. We see if we need more organic matter, compost, nitrogen, or micro-nutrients like sulfur and boron. 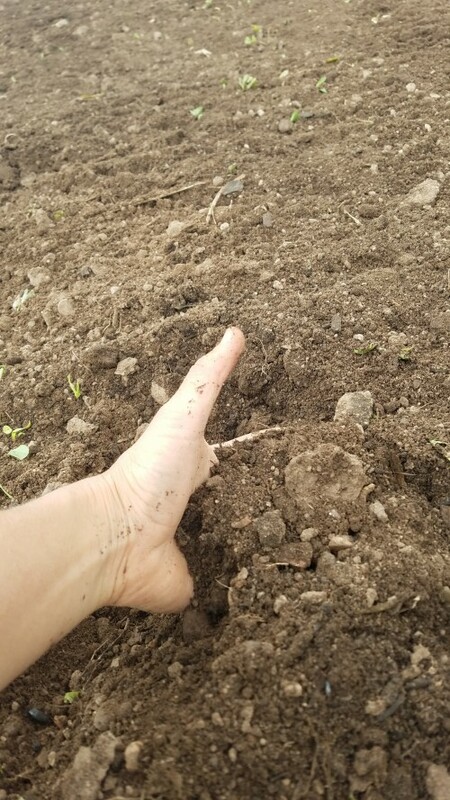 This is some of the soil in a new field that we're planting this year, right before some baby melon plants went in! We got in and tilled it at just the right moisture content, so this soil is extra fluffy and dreamy to work in. As stewards of the land (that means you too-we couldn't do this without you) it's a joy to build soil, knowing that we are increasing fertility and increasing good food to come. It's spring, which means it's greens season! Leaves are the first things out of the ground, which is perfect because spring greens and salads and herbs are a tonic for the digestion, promote cleansing after the winter and are potent antioxidants! Rinse greens. Drain and cut leaves and stems into 1/4"-1/2" strips and pieces. In a large skillet, heat extra-virgin olive oil over medium heat. Add stems, garlic, and onion and sauté until onion softens. Add the leaves and cook, stirring occasionally, until tender and bright green, about 5 minutes. Finish with a squeeze of fresh lemon juice. Volunteer Opportunities: Seeking Tuesday Distribution Help! If you would like to have a deeper understanding and involvement with the farm, and have some extra time on Tuesday afternoons, consider signing up for a volunteer share through our volunteer coordinator, Mollie Hayden, for more info please email mollie.hayden@botanicgardens.org You will receive $200 off your share price. Posted 6/1/2017 1:03pm by Josie Hart. 3:30-7p.m. in the CSA washstand at Denver Botanic Gardens Chatfield Farms. When you arrive at Chatfield farms, please park in the gravel lot and follow the pathway towards the historic Hildebrand ranch house. Past the farm animals on your left is the CSA washstand. You will see CSA signage and our box truck with vegetables on it out front. Please remember your own bags (ziplocs for greens) and to sign in for each share you are picking up. Eggs, bread, mushrooms, and the Balanced Belly share will all picked up today. See you at 3:30 - Chatfield Farms! Posted 5/30/2017 4:40pm by Josie Hart. Happy Tuesday - Tuesday is an awesome day because it is the day you head to DBG 909 York St. 80206, to pick up your vegetables! When you arrive at Denver Botanic Gardens, head to the south end of the parking structure on the top level (street level) under the evergreen trees. You will see our veggie box truck and tables set up with produce. Pick up every Tuesday is from 4-7 p.m. Please remember to bring your own bags to store fresh produce. You will check in at the beginning and select your own veggies and herbs. If you purchased an add-on share, you will sign for your eggs, mushrooms, bread and Balanced Belly drinks! We are looking for volunteers to help us out at weekly distributions! We need people from 3:30 - 7 p.m. As you volunteer, you can help other shareholders, chat about cooking and pick up your share. We will give you a $200 dollar discount on your share this year, at the end of the season. Your CSA needs YOU! Thanks and see you this afternoon! Posted 5/30/2017 4:11pm by Josie Hart. Posted 5/27/2017 7:29pm by Josie Hart. 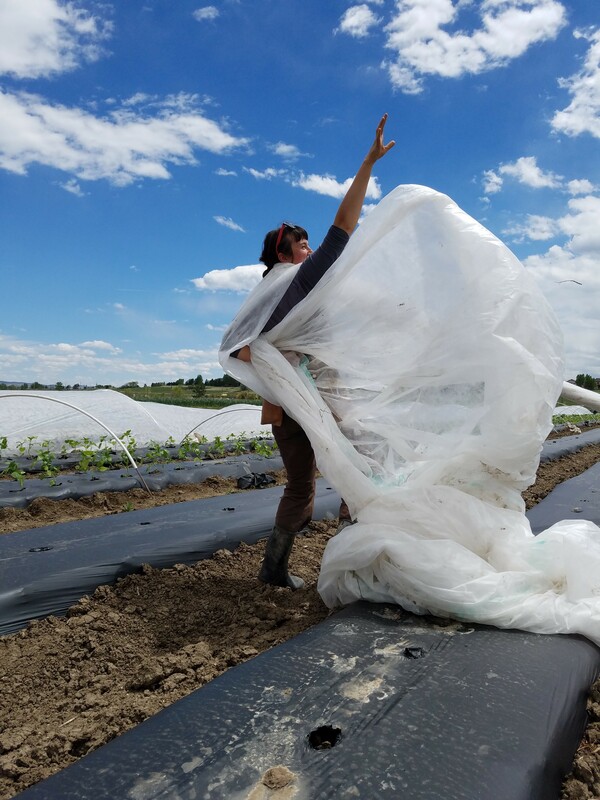 Welcome to the CSA season at Chatfield Farms! Thanks for bearing with us as we get started. Without distributions we were able to concentrate on planting the first of the summer crops, after our snow and freeze. We planted 1200 eggplants, 2600 tomatoes, and 9000 peppers! That's Betzi, upbeat and glorious amidst the swirling winds! 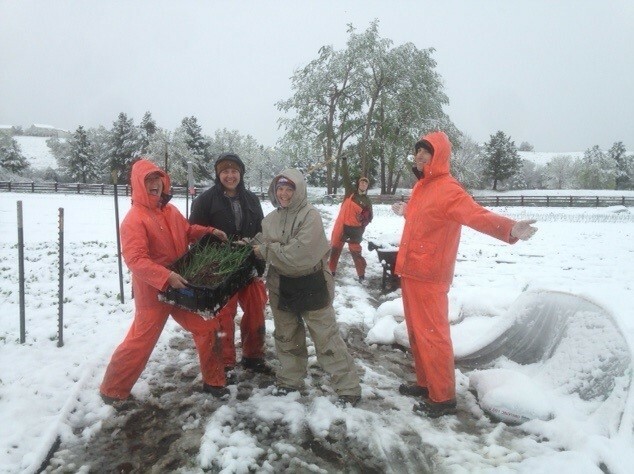 It can be hectic and stressful out there, especially when you are risking all 9000 peppers plants if there is another late freeze, but we take great comfort in knowing that we serve a knowledgeable and caring group of shareholders. Also I can say with confidence that on any given day out in the fields there is literally nothing we'd rather be doing! Combine the sliced Hakurei in a small, nonreactive bowl with the 2 t lemon juice, sugar, and 1/2 t salt. Let sit for 5 minutes, tossing occasionally. Combine the arugula and mint in a medium bowl. Squeeze the juice from the remaining 1/4 lemon over the greens, then drizzle on the oil. Sprinkle with the remaining 1/4 t salt and toss to incorporate. Taste, and season with more lemon juice, oil, and/or salt as needed. Divide the arugula-mint mixture among 4 individual plates, mounding each portion. Sprinkle some of the crushed almonds on top. Drain the liquid from the radishes and arrange them in the center and around each mound of greens. Use a vegetable peeler to shave 5 or 6 thin curls or shards of cheese over each portion. Sprinkle each portion with the remaining almonds; then drizzle with the honey. Garnish with the edible flowers or mint sprigs, if using. NOTE: Toast the almonds in a small, dry skillet over medium-low heat, shaking the pan to avoid scorching, until the nuts are fragrant and lightly browned. Cool completely before using. If you purchased any of our add-on shares, you will be picking up your first round this coming week. Eggs, mushrooms, bread and the balanced belly drinks will all be ready for pick up on both Tuesday at York St. and Thursday at Chatfield. You will need to sign for each share. You will not need to bring an egg carton this year for your eggs. New regulations state we must provide cartons to make sure they are clean. The add-on shares will last 20 weeks, until Mid-October. If you are unsure about what shares you purchased, please visit our homepage and click on the Membership Portal and view your account. Please keep in mind the fruit share does not start until Mid-July. Please bring your own bags including zip loc bags or something similar to keep your fresh greens in. Sign in with our farmers at each distribution and use hand sanitizer if you need to. Read each chalk board to know the quantity to take of each item in the basket. You don't have to take an item that you know you won't use - leave in the basket or give it away, it is your choice. Always rinse off all your produce before storing with cool, running water. If you receive a bunch of something (like turnips, beets or carrots, etc) when you get home remove the tops of each bunch and set them aside (look up recipes on how to eat these also). Store your veggies in sealed air tight containers, and they will last far beyond any store bought produce. Tomatoes and basil (some other items too) do not need to be stored in a fridge. Cooling fruits for an extended period will diminish the fresh, sun ripened flavor. We can't wait to help feed your family and our families too! See you next week and Happy Holiday! Posted 5/19/2017 11:42am by Josie Hart. Hello from snowy Chatfield Farms! With temperatures possibly dipping down into the high 20s here, we'll have to see how the crops come through the weekend before we make a call on starting distributions next week, as originally scheduled (weekly at 4p.m. - Tuesday and Thursday). We'll be back in touch by Monday to let you know if we will have distribution next week or push it back to the following week. In the meantime, I'd like to introduce our staff this season, or rather have them introduce themselves. Here's a photo of the crew from today and a brief introduction. Betzi: I'm so excited for my third season farming here at Chatfield Farms, the sixth season of my farming career. I love good work for its own sake and it's important to me to be connected to community and the land. Alicia: I'm excited for my first season working on a farm. Last summer I was here learning about farming with the Veterans Farm Program and I'm enjoying putting that knowledge to use here at Chatfield Farms and in my garden at home. Jordan: I have been lucky enough to farm on the East Coast and make my way out to Colorado for the season. Looking forward to sharing recipes with you all this season! Lindsay: The "Okra King!" I recently moved to Colorado and am very excited to be a part of the team at Chatfield Farms. This is my fourth year growing organic produce and I am working to start a market farm of my own. Tim: Hello! I'm 24 years old. I'm originally from Boulder and a Colorado State alum. This is the third CSA program I've worked for and I'm really excited to be part of the Denver Botanic Gardens Chatfield Farms team! And of course, Phil Cordelli, CSA Farm Manager is at the helm of the CSA Farm with Josie Hart, Program Manager reaching out on a regular basis to you all--we are both here if you have questions or need help navigating! This weekend we will send a brief "How To" for our CSA distributions so all who are new this year feel comfortable at our market-style CSA. We look forward to feeding your family and getting to know you. The land here belongs to all of us and we are excited to be good stewards of it! Posted 4/10/2017 12:32pm by Josie Hart. An imbalance of probiotic or beneficial microbes to pathogenic microbes in the gut can be indicted in ailments ranging from depression to gluten intolerance, to acne. This year we are offering you and your digestive system a choice. Restoring your gut can be a fun and beautiful adventure. We are hand-crafting and curating an intentional and delicious probiotic experience that you can’t find…anywhere but here. We’re bringing you something new and delicious every single week for 20 weeks, exposing you to a diversity of beneficial microbes, organic herbs, spices and local fruits and veggies. Each Week you'll will receive a probiotic cocktail like our Immortal Jun Tea (with a base of unusual, organic fine teas from China, raw Rocky Mountain honey & El Dorado spring water). Or, one of our mineral rich “BioBeers” incorporating our organic roots, herbs and seasonal fruit from Colorado farms and orchards wrapped up into creations like The Tale of Ashwagandha (local berries, ginger, bitter orange peel, passionflower, lime juice, raw honey…etc). Each Month you’ll receive a pound (16 oz) of probiotic veggie creations such as: Mamma CJ's Summer Kimchi, our Ayurvedic curry kraut - recipes are from experts around the world that focus on the heritage of foods from India, Korea, Germany, etc. We bring you organic spices and flavors from around the world with organic veggies grown by Colorado’s most talented farmers. Five Points Fermentation will send you a love letter each week describing her bio brew creations and cultured veggies along with their health benefits and recipe stories. You will also have access to exclusive, hands-on traditional food workshops and culinary events. $20 a week, charged to your account on a monthly basis ($80 a month). This share is 20 weeks long, $400 total each share. Reach out directly at fivepointsfermentation@gmail.com or questions and preview some of the upcoming flavors and recipes. Posted 3/27/2017 11:46am by Josie Hart Genter. MONROE FARMS - oldest organic farm in Co. - several sites in Denver. We wish you fresh, healthy and local eating this summer! Thanks so much for being involved in the local farm movement. We need YOU! Posted 3/24/2017 12:20pm by Josie Hart. One update: The first pick up days are going to be Tuesday May 23 and Thursday May 25. Shares SOLD OUT! See our list of partner farms that still have 2017 shares. Posted 3/24/2017 10:24am by Josie Hart Genter. We are sold out of our 2017 CSA shares! 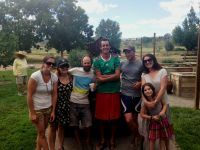 If you are still looking for a CSA this summer, we have put together a list of Farms that do CSA pick up locations in the Denver area. All these farms have CSA pick ups at several Denver locations. You can still purchase add-on shares from our website through the month of April. Shares still available are eggs, fruit, mushrooms and our new fermentation share. Please use the member portal to update your share types from our homepage.You must already be a member with us to purchase the additional shares.